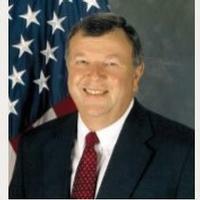 Barry J. Baskett served as a member of the Senior Executive Service and Associate Director for Aviation Technology reporting directly to the Director of the Army Aviation and Missile Research, Development and Engineering Center at Redstone Arsenal. Barry Baskett was also an AHS Honorary Fellow. He was born in Evansville, Alabama on December 27, 1942. He received a B.S. degree in aircraft maintenance engineering and from St. Louis University Parks College, St. Louis and a M.A. degree in business administration from Webster University. Since 1971, he was employed by the U.S. Army Aviation and Missile Command and its predecessor organizations in a variety of leadership roles. He began his career as a systems engineer supporting the Bell UH-1 and AH-1 series aircraft during the Vietnam War. As a lead project engineer with the Advanced Scout Helicopter (ASH) Project Office, he led a team that assessed and improved the aircraft’s mission equipment package. Mr. Baskett was then assigned as the senior project engineer for the advanced sighting systems for the Apache Attack Helicopter. The Target Acquisition Designation System (TADS) and the Pilot Night Vision Sensor (PVNS) offered major challenges for integration onto a rotary wing platform, but Mr. Baskett and his team were up for the task. Assigned to the Aircraft Survivability Equipment Project Manager’s Office, he led efforts to develop, procure and integrate the radar warning system as well as infrared and radio frequency decoy dispensers for all international programs. Mr. Baskett was then assigned as the Director of Systems Management in the Program Executive Office for Aviation, where he served as chief engineer for all aviation systems assigned to the PEO. Later, as Director for Advanced Systems in the Aviation Systems Command, he led efforts to energize technical exchanges between the government and industry that greatly improved working relations between the two. In his next assignment, Mr. Baskett returned to the world of systems engineering to serve as the Director of Engineering with total systems engineering responsibility for all aviation platforms. During this time, he led the development of qualification standards and requirements for the RAH-66 Comanche helicopter. Most recently, as the Associate Director for Aviation Technology, he led efforts to provide advanced capabilities that would support Army transformation. The Vertical Flight Society is accepting contributions to the Vertical Flight Foundation (VFF) towards the Barry J. Baskett Scholarship. Please go to www.vtol.org/donate to make a donation in memory of Barry J. Baskett.